※"N" condition may be clothes alterations such as hem is shorten. Color : Blue. Never transfer it to the third-party. About privacy. With Leather Badge, in Size 8S. Details as follows Rise:8.5" (from the crotch seam to top of waistband). Thoroughly Washed and Clean! Just Give it a Fluff and You're Ready to Wear! Material: 99% Cotton 1% Spandex/Lycra. 5 Pocket with Leather Badge! Details as follows Thoroughly Washed and Clean! Just Give it a Fluff and You're Ready to Wear! Zipper fly. Size.6 M. (taken lying flat). 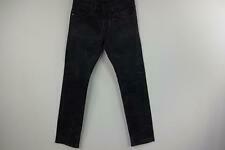 ※"N" condition may be clothes alterations such as hem is shorten. Never transfer it to the third-party. Color : Black. About privacy. ※"N" condition may be clothes alterations such as hem is shorten. Color : Blue. About privacy. Womens Jeans. Condition is Pre-owned. Shipped with USPS Priority Mail. These are really cute jeans and will go with anything and everything! Roll the bottom with tennies or wear them long with heels. The holes that you see in front have a patch behind them so no skin shows. These are great cuffed thick with boots. They have never been worn. They come from a smoke and pet free home. Thank you! Care Instructions: Machine Wash. Cut: Straight. Waist: 15.5". Leg opening at thigh: 11”. At knee: 7”. Leather Patch! Rise in front: 9”. Rise in rear: 13.5”. Button holes are all snug. Overall length from waist down to cuff: 39.5”. Waist- 17”. Inseam- 30”. Taken Flat. Condition described above! These work great cuffed or with a raw hem. 99% Cotton with 1% Stretch. 24" Inseam. Selvedge Edged Pockets. Excellent Pre-Owned Condition. NEW With Tags Size 4 Medium 27W x 30L Burgundy “Marrón” Color super skinny stretch pants with leather illusion on front . Comes from smoke and pet free environment. Made in the USA. Crotch: 11". Outseam: 43". Never transfer it to the third-party. Color : White. Material :Cotton100%,(Label)Cow leather. About privacy. ※"N" condition may be clothes alterations such as hem is shorten. See photos for details. Inseam 34". You a bidding on a lovely pair of Levis 273 in dark blue that’s in very good condition, but has no leather label on the back. Any questions, please just ask!! Happy Bidding!! Very good used condition , please see photos. When considering a correct fit please refer to the Actual measured size as it is common for jeans to change size over time and differ from the label size. . Jeans & Denim. Waistcoats & Gilets. The item you receive will be a unique piece of history. 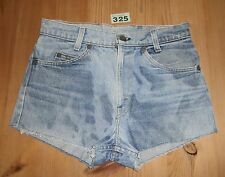 Women's Blue LEVI Leather Label W29" Denim Cut Off, Shorts, 11" rise. These shorts with a zip fly are in excellent ready to wear condition. 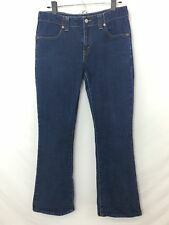 Levi’s women’s 571 light blue wash slim fit jeans. Very good condition. W28 L34 Please ask any questions I’ll be more than happy to respond and please check out my other items.